The UK lost one of its six remaining riders today when James West crashed out of stage 11 smashing both fuel tanks on his factory supported Sherco. 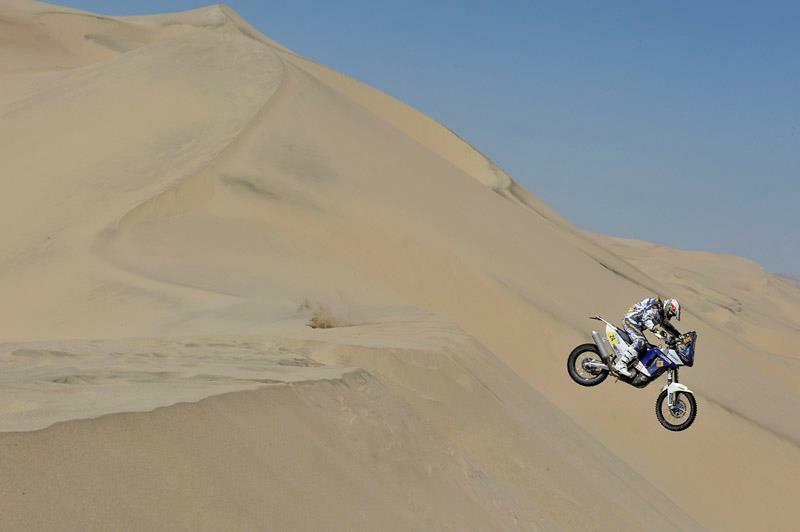 The 37 year old Dubai based Brit has had a tough first Dakar suffering a host of technical problems during the race. But it was a rock and subsequent crash that left his bike un-rideable and forced him to retire. Speaking to MCN, he said: “I’m absolutely gutted, after the problems I’ve been having all I wanted to do was finish but that became impossible. I was only about 5km into the stage when I hit a rock that was covered by the sand. It threw the bike sideways and I was already crashing when I collided with another rider. I was in fourth gear so it was pretty quick and I ended up ending up on a load of rocks. Stan Watt rode a strong stage 11 finishing in 38th position leaving him 31st overall. Having navigated without any issues and ridden hard in the sane, Watt thught he could be on for a good result and was left disappointed at the finish. He said: “I’m actually pretty disappointed because I thought we’d have done better than that. It was pretty rough out there and there were a few hidden hazards because of the heavy rain which meant a few extra rivers. “It wasn’t that good to be honest as I made a few navigational errors. I need to believe in myself more because I ended up following some other riders when I shouldn’t have done. I ended up following some guys even though I wasn’t sure and when I turned around and did my own thing I got it right. Lyndon Poskitt was unable to show his normal pace on stage 11 after finishing 70th on the stage and 46th overall. He said: “I just didn’t gel with the bike today so I ended up taking it pretty steady. I had to go back for the first way point after I missed it, bit I wasn’t the only one, there were people everywhere trying to find it. “It’s the fourth day I’ve had to ride without a working road book and every time it’s been a different reason for the problem which is really frustrating. It worked perfectly on the liaison, but as soon as I started the Special it stopped. It was really rough going right from the start and the type of terrain that you needed to have both hands on the bars. I was happy to follow the tracks at the start thinking that I’d catch up on the road book later, but straight away everyone was lost trying to find way point one. Craig Bounds is now a regular top ninety finisher despite his injuries, He ended the day in 83rd which leaves him 84th overall, but revealed to MCN that he missed the last way point so is expecting to get hit with a time penalty in the final results.